Volunteers are needed for the Jefferson Park Jubilee, an all-day celebration at the park on July 14 from 11-9 p.m. Help is needed in a variety of roles throughout the event. Volunteer shifts may start as early as 8 a.m. to help set up or run as late as 10 p.m. when cleanup is done. Interested and willing? Fill out the “Contact Us” form on the Beacon Hill Merchants website. Please include the subject line “Volunteer for Jubilee,” and provide your contact information. 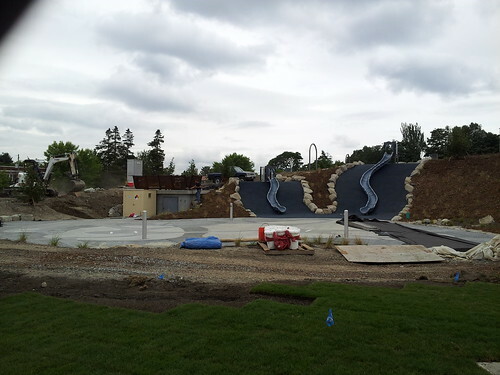 Among the things to celebrate at the Jefferson Park Jubilee will be the completion of the Beacon Mountain playground, shown here as it was a few days ago, approaching completion. Photo by Melissa Jonas in the Beacon Hill Blog photo pool on Flickr.